Auditing is defined as the process of audit or review of some records or invoicing agreements that has been done for ensuring the accuracy of certain data or information. Telephone auditing and outsourcing can make the process easier. Isplchennai is one of such leading call center & BPO company that specializes in telephonic auditing. The process involved in telephonic auditing benefits with time and money, so most of them are opting for this method for auditing. The litheness and flexibility in this process makes it popular among many business and organizations. At Isplchennai, the auditing process is carried out for any kind of products or services offered. This telephonic auditing process is recorded for references and with the help of this reference, it will be easy to take necessary action if in case anything goes wrong. 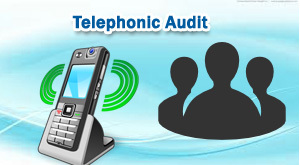 Telephonic audits is done mainly whether the information or statistics are accurate or not and also for cross-checking. With the help of our highly trained and skilled operators, we aid your business by providing the competitive tip that it requires to increase revenue in your business. For more information on our services, contact us today via email or call free on +91 44 42925000.